Hi! 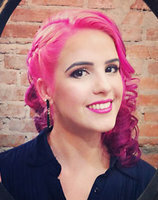 I'm a Brazilian girl, 25 years old, self-taught illustration artist. Currently I'm working with graphic design and illustration and I'm interested in all kinds of styles. That's why I prefer not to work with a single one, I like to be constantly experimenting. My emphases is on modern cartoon style.